The standard floating head used on the 4K316SSB oil skimmer is made a polypropylene fabric concertina machined with a rigid PVC head that floats at the surface. As water is drawn down through the concertina it automatically adjusts its horizontal position relative to the water’s surface to allow the required amount of water as drawn by the pump to pass over it. The depth to which the weir positions below the surface of the water is known as the “cut”, the less the amount being pumped the finer the cut. It stands to reason therefore that the finer the cut is the heavier will be the concentration of contaminant drawn over the weir. 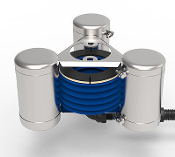 We have tested the materials used to construct the 4K316SSB oil skimmer and found them to withstand high water temperatures and a wide variety of solvents including hydrocarbon-based materials as well as salt and caustic solutions.